In legend, few creatures command such powerful, superstitious awe as giants. In fantasy campaigns though, they are often dismissed by players, seen as a mere step on the way to higher level encounters with dragons or demons. A means of garnering plenty of experience points, but not a serious challenge to a well-equipped party with a spellcaster or two and the first clue about tactics. Such a complacent attitude can be very dangerous, particularly if the giants use their natural advantages to maximum effect. Giants are often encountered first singly or in fairly small groups, either menacing a local community or preying on lesser travellers through mountainous country. At higher levels they may be found in larger tribes, often working with lesser creatures such as ettins, trolls and even lowly orcs, along with the occasional powerful enemy such as a dragon. 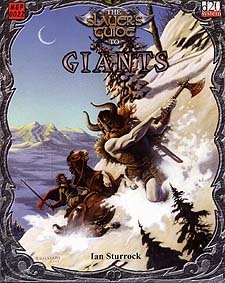 With almost as much versatility as the typical humanoid creature, most giant races are capable of advancing in character classes, and whether simple barbarians to capitalise on obvious strengths or more dangerous classes such as the much feared giant sorcerers, adepts and clerics these advanced giants can provide a serious boost to the challenge set by any giant encounter. This present volume comprises knowledge drawn from scholarly studies alongside tactics and survival tips offered by adventures who have tangled with giants and live to tell the tale. Games Masters will learn many intricate details about giant life and culture, enabling them to make truly memorable encounters with this race for their players, while the players themselves may learn a fact or two that just might save the lives of their characters. Requires the use of the Dungeons & Dragons Player's Handbook. This product utilizes updated material from the v.3.5 revision.